The Northern or Northwestern is a genre in various arts which tell stories set primarily in the later half of the 19th century in the north of North America, primarily in Canada but also in Alaska. It is similar to the Western genre but many elements are different, as appropriate to its setting. It is common for the central character to be a Mountie instead of a cowboy or sheriff. Other common characters include fur trappers and traders, lumberjacks, prospectors, First Nations people, settlers and townsfolk. International interest in the region and the genre was fuelled by the Klondike Gold Rush (1896–99) and subsequent works surrounding it, fiction and non-fiction. The genre was extremely popular in the inter-war years of the twentieth century. Northerns are still produced but popularity waned in the late 1950s. Northerns are similar to westerns but are set in the frozen north of North America; that is, Canada or Alaska. Of the two, Canada was the most common setting, although many tropes could apply to both. Popular locations within Canada are the Yukon, the Barren Grounds, and area around Hudson Bay. Generic names used for this general setting included the "Far North", the "Northlands", the "North Woods", and the "Great Woods". Common settings include boreal forests, isolated cabins, and mining towns. Snow featured to such an extent that Northern films were sometimes termed "snow pictures". Animals were a common feature too. Dogs and dog sleds were popularized by The Call of the Wild and White Fang. Scenes involving attacks by bears date back to The Klondyke Nugget. Northerns often explore the 'Matter of Canada' (the national mythos of Canada, after the Matter of Rome). Common elements of which are the Black Donnelly murders (February 1880), the North-West Rebellion (1885), the Klondike Gold Rush (1896–99), the pursuit of Albert Johnson (January 1932), the October Crisis (October 1970), and persistent national anxiety about potential annexation by the United States. The Western idea of lawlessness set in American towns was not a part of the Canadian Northern, though individual lawbreakers or uprisings by Canadians feature in works such as Quebec (1951), Riel (1979), and Northwest Mounted Police (1940). In Northerns and wider crime fiction, the general Canadian preference is for law enforcement to be performed by the state rather than vigilantes or private investigators. Likewise, Northerns rarely feature the heroic outlaws often found in Westerns. On the subject, David Skene-Melvin writes "Canada never had a Wild West because the Mounties got there first," while Margaret Atwood writes "No outlaws or lawless men for Canada; if one appears, the Mounties always get their man." Law and order in Northerns set in Canada is most often represented by the Mounties, either the North-West Mounted Police or Royal Canadian Mounted Police depending on era. Like snow, Mounties are a common enough feature to become a synonym for the genre, with Northern films sometimes called "Mountie films". Their popularity was not confined to film; by 1930, 75 volumes of written Mountie fiction had been published, not including juvenile fiction and material published in magazines. Where a protagonist in a Western is often part of both civilization and the wild (whether native or criminal), Mounties in Northerns are entirely a part of civilization. The nature of fictional Mounties can vary depending on the nationality of the author. Mounties as written by British authors are often younger members of upper class British families serving the British Empire in the colonies. American-authored Mounties are often little different from US Marshalls and project the values of Westerns in that they place their individual sense of justice and conscience above their duty to the law. Canadian-authored Mounties represent, and are self-abnegating champions of, the Canadian establishment and its laws. Further, their authority does not come from either their social class or physical abilities; such a Mountie "upholds the law by moral rather than physical force". 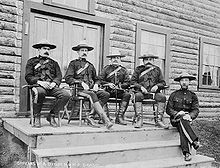 A common story outline for Northerns involving Mounties is a pursuit, confrontation and capture: the Mountie's pursuit of a fugitive takes place across the Canadian wilderness and may be resolved non-violently. According to Pierre Berton "the French-Canadian was to the northerns what the Mexican was to the westerns — an exotic primitive, adaptable as a chameleon to play a hero or a heavy." French-Canadians were a ubiquitous element of the genre. As characters, French-Canadians are typically depicted as rustic and uneducated. These characters were usually divided into two broad types: the heroic, happy-go-lucky bon-vivant and the villainous, lecherous killer. Some later examples merged the two stereotypes into a charming, roguish anti-villain. Common visual elements were a tuque, a sash and a pipe. All were present in the first appearance in film, in A Woman's Way (1908). Female French-Canadian characters also followed the "tempestuous" stereotype of female Mexican characters. Mexican actress Lupe Vélez, in line with her identity as "The Mexican Spitfire", played the title character in Tiger Rose (1929) in this mode; as did Renée Adorée in The Eternal Struggle (1923) and Nikki Duval in Quebec (1951). A common anachronism in Northerns was the tyranny and absolute power of the Hudson's Bay Company and its officers, even into the modern period. This was repeated not just in fiction but by reviewers and critics too. The concept of La Longue Traverse, or the Journey of Death, comes from The Call of the North (1914) and was popular in later films. In this, the Hudson's Bay Company executes convicts by forcing them into the wilderness without equipment or supplies. In 1921, the Hudson's Bay Company successfully sued the Famous Players-Lasky Corporation for the villainous portrayal of their Company in the latters' remake The Call of the North. Alaska Natives or Métis are featured in some depictions. Besides being set in Canadian Prairies, the stories often contrast the American frontier with the Canadian frontier in several ways. In films such as Pony Soldier and Saskatchewan the North-West Mounted Police display reason, compassion and a sense of fair play in their dealings with Aboriginal people (First Nations) as opposed to hotheaded American visitors (often criminals), lawmen or the American Army who seem to prefer extermination with violence. The Klondike Gold Rush during the 1890s in Canada and Alaska brought a lot of wider, international attention to the far north of North America. Adventure novels from veterans of the gold rush—such as Jack London's The Call of the Wild (1903), Rex Beach's The Spoilers (1906) and Robert W. Service's The Trail of Ninety-Eight (1909)—became best sellers. These inspired more adventure fiction which grew in popularity throughout the first half of the twentieth century. The genre was extremely popular in the inter-war years, with a "Mountie craze" hitting its peak during the mid-1920s. One of the earliest international examples of the genre is the British play The Klondyke Nugget, which was first performed in 1898. Its author, Samuel Franklin Cody initially wrote it as a Western but changed the location to capitalize on the contemporary gold rush. Charlie Chaplin's 1925 film The Gold Rush is a comedy that parodies some of the cliches of the Northern genre. The Looney Tunes character Blacque Jacque Shellacque, who first appeared in the 1959 short Bonanza Bunny, is another parody. Photo of Richard Simmons as Sergeant Preston and Yukon King from the television series Sergeant Preston of the Yukon. Big Joe Mufferaw, woodsman Paul Bunyan of Canada. The Spell of the Yukon by Robert W. Service, including "The Shooting of Dan McGrew" and "The Cremation of Sam McGee"
^ a b c d e f g h i Skene-Melvin, David (2014). "Canadian Crime Writing in English". In Sloniowski, Jeannette; Rose, Marilyn (eds.). Detecting Canada. Wilfrid Laurier University Press. ISBN 9781554589289. ^ Atwood, Margaret (1972). Survival: A Thematic Guide to Canadian Literature. ^ a b c d e f g h i j k Berton, Pierre (1997). "Hollywood's Canada". In Cameron, Elspeth (ed.). Canadian Culture. Canadian Scholars’ Press. ISBN 9781551300900. Berton, Pierre (1975). Hollywood's Canada: the Americanization of our National Image. McClelland and Stewart. ISBN 9780771012235.